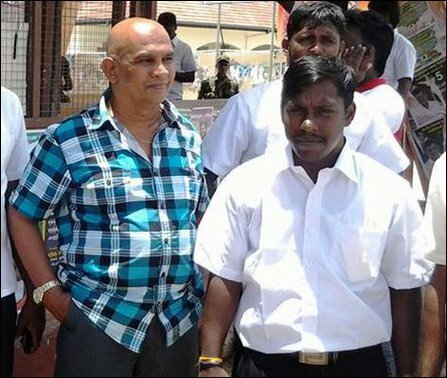 A former EPRLF (Varathar wing) paramilitary operative turned ‘sanitary worker’ at the secretariat of SL Governor to North, 30-year-old Sivarasa Sivakulan alias Murali, has been harassing Tamil public servants who have been sympathetic to the kith and kin of the struggling political prisoners, Tamil journalists and activists who have been supporting the elected Chief Minister of the NPC. The SL operative has handed over details of Tamil public servants, who took part in the black flag protest and demanded the SL Presidential Security Division (PSD) to punish them through SL Presidential Secretariat instructions to relevant ministries. The harassment has already begun with instruction of transfers being sent to North, informed sources in Colombo said. A Ministerial Security Division (MSD) officer in charge of SL Governor's security is also involved in the latest operation. A public servant should not be subjected to harassment for his or her participation in democratic protests after working hours. But, such rights are only in paper as far as the public servants are concerned in the occupied homeland of Eezham Tamils. Murali, believed to be a SL military intelligence operative, is a close confidante of Reginald Cooray, the colonial governor to North. He was also connected to the controversial discovery of explosives at Ma'ravan-pulavu, Thenmaraadchi, last year. Although, he was detained for interrogation for several days in Colombo in connection with the episode, SL military intelligence and Mr Cooray, managed to secure his release and re-instated his employment at the secretariat, the sources further said. Although officially employed as a ‘sanitary worker’, Murali is the most relied operative by the SL Governor and he is assigned the task of handling the contacts with Tamil journalists and accompanies SL Governor whenever he addresses foreign diplomats visiting Jaffna. He works also closely with Cooray's Personal Secretary J.M. Somasiri, who is a Sinhalese. Highly placed sources in Colombo told TamilNet on Tuesday that the SL Presidential Secretariat officials were acting on his information to punish the Tamil public servants, especially those who attended the black-flag protest against the SL President last Saturday, with transfer orders. Murali has also been instrumental in handling contacts with certain Tamil politicians to whom the SL Governor had promised negotiations with SL President on the matter of the Tamil political prisoners who are on a fast-unto-death. On Saturday, Murali was accompanying Mr Somasiri in latter's vehicle and joined the team of visiting SL President at Jaffa Hindu College. Trained by SL military intelligence, the paramilitary operative was identified by Maj Gen G.A. 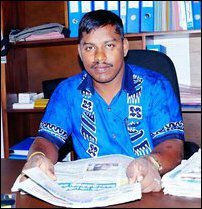 Chandrasiri (SL commander of Jaffna between 2005 and 2009) as a trusted collaborator of the occupying SL military in Jaffna. Later, when Chandrasiri became SL Governor to North, his successor, Maj Gen Hathurusinghe operated him directly from Palaali military base. Murali emerged as a close confidante of Hathurusinghe and SL President Mahinda Rajapaksa's camp of the SLFP. Hathurusinghe introduced Murali to Reginald Cooray when the latter toured Jaffna as SLFP campaigner on behalf of the former SL President. Murali's father and mother, both of whom had worked closely with Varatharaja Perumal and Subathiran of the EPRLF, handed him over to the paramilitary group at a young age. Murali began his paramilitary career at the press of Ka'n'noaddam, the propaganda magazine of the paramilitary outfit, which was operating from Colombo in mid 1990s. The EPRLF, which was attacked by the LTTE in 1986, had left militancy in 1988 at the instance of India and the Sri Lankan government and contested the NEP provincial council elections in the face of opposition from the LTTE. EPRLF's Varadaraja Perumal was installed as the first Chief Minister of merged North-East Province by the Indian Government after its military intervention based on the Indo-Lanka Accord. In 1990, when the Indian army began withdrawing from North-East, Perumal also feld to India. EPRLF's leader K. Pathmanaba was assassinated in Tamil Nadu, allegedly by the LTTE in June 1990. A section of the group was later based in Colombo and was used by the SL military intelligence against the LTTE as a paramilitary outfit. During the presidency of Chandrika Kumaratunga many of its members were on the payroll of SL Government. The payroll was directly managed by the SL military intelligence. A faction led by Suresh Premachandran distanced from the paramilitary modus operandi of the group and orientated the EPRLF towards Tamil struggle in 2000 abandoning the links with the military intelligence of Colombo and New Delhi. ‘Suresh wing’ opposed ‘Varathar wing’ from making claim to their late leader K Pathmanaba as part of the party name and has finally claimed sole right to the name of the EPRLF, which stands for Eelam Peoples’ Revolutionary Liberation Front. Varathar-wing is now organised as Social Democratic Party of Tamils (SDPT) under the leadership of Varatharaja Perumal, who is based in Jaffna. 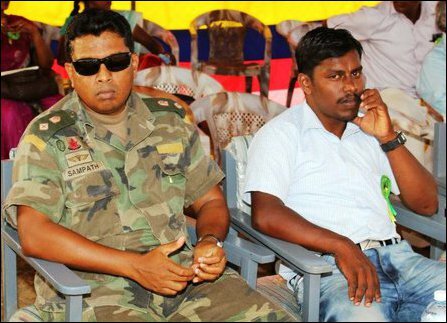 A number of young Tamils caught up in the orientations of their leaders have become ‘Counter Insurgency’ (COIN) operatives at the hands of the SL military establishment and its foreign operators. This also includes renegade LTTE members led by Karuna and Pillayan and post-2009 recruits among the incarcerated former LTTE members.